Classically elegant, this distinctive and acclaimed body powder offers the perfect perfumed finishing touch. 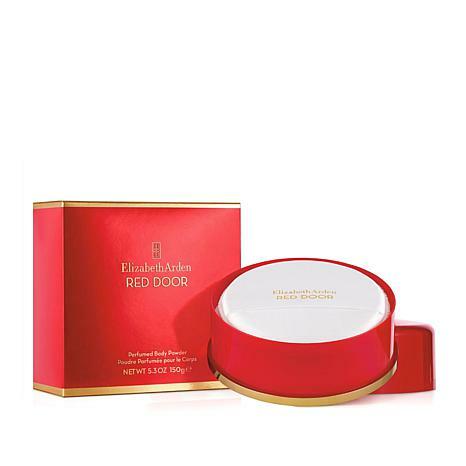 There has always been something almost-magical about the iconic Red Door and the beauty secrets that come from within. Dust this powder on and open your own door to fragrant fantasies. 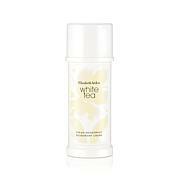 Ingredients: TALC, SILICA, PARFUM/FRAGRANCE, MICA, METHICONE, CALCIUM CARBONATE, KAOLIN, TETRASODIUM EDTA, SILK POWDER/SERICA/POUDRE DE SOIE, ALPHA-ISOMETHYL IONONE, BENZYL BENZOATE, BENZYL SALICYLATE, EUGENOL, FARNESOL, HYDROXYCITRONELLAL, ISOEUGENOL, LINALOOL, BISMUTH OXYCHLORIDE (CI 77163), CHROMIUM OXIDE GREENS (CI 77288), IRON OXIDES (CI 77491), TITANIUM DIOXIDE (CI 77891), ZINC OXIDE (CI 77947). 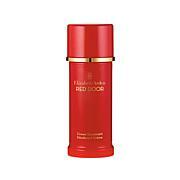 Elizabeth Arden has one of the very best body powder on the market. Lasting scent and comfortable. This also goes for the Red Door perfume. I have always counted on the scent to be light and lasting, at work or play! Returned. Unopened with Perfume I ordered.